Mrs. Mary (Mae) Smith, 85, Hickory Grave Road in Acworth, died Wednesday. Funeral services were scheduled for Friday at 2 p.m., from the Shady Grove Baptist Church with the Rev. Roy England officiating. Burial was to be in the Old Macedonia Cemetery in Cartersville, Georgia. She is survived by her daughter, Mrs. Lillie McGhee of Acworth, two sisters, Mrs. Viola Adcock of White, Georgia, and Mrs. Linda Anderson of Cartersville; two granddaughters, Miss Jocie McGhee of Acworth and Mary Durham of Marietta; three great-grandchildren, two great-great-grandchildren and several nieces and nephews. 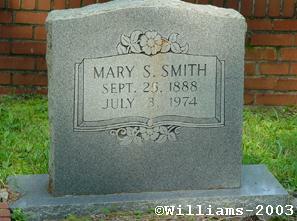 She was a daughter of Ezel Atkinson and Mary Howell Atkinson.